This may look like an older home from the curb, but it’s brand new and part of Louisville’s 2011 Homearama in the Norton Commons neighborhood. 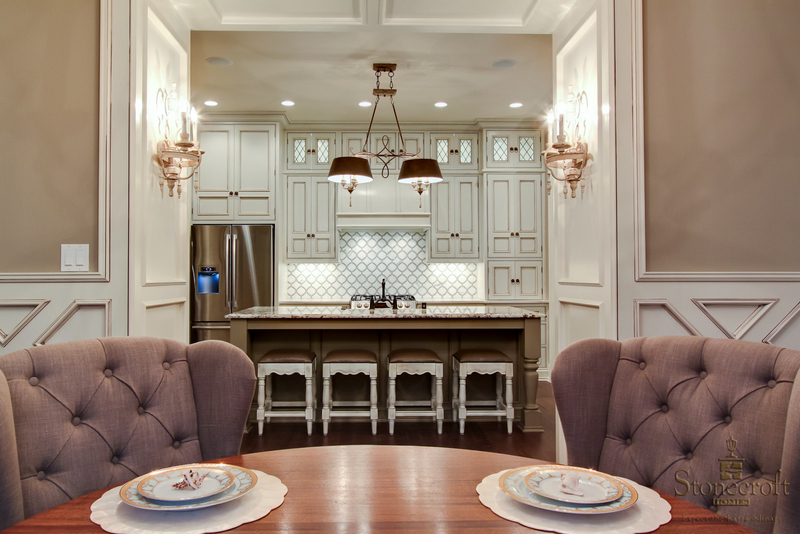 I love a good Homearama, and I thought you’d enjoy a peek inside one of the houses on the tour. I would love to see this neighborhood in person. It looks like there are a lot of charming houses here! This one overlooks a public square with a fountain that you can see in the video tour (below). 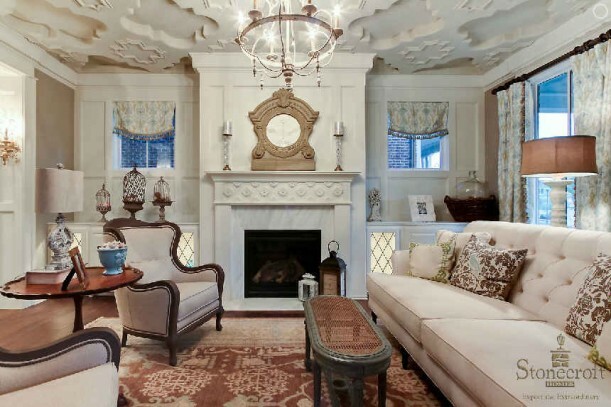 The ceiling and trim details in the house are interesting to see, especially in a new house. 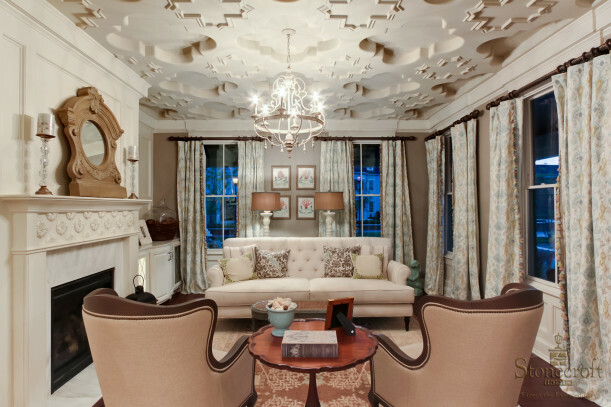 I couldn’t handle that much pattern on my own ceiling, but it’s beautifully done. The interior design was done by Gretchen Black. The house has 4,456 square feet. 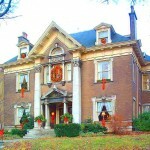 The Robbens Nest has already sold for $689,000, but it’s part of the Homearama tour through July 31, 2011 in Louisville, Kentucky. More photos and information at Stonecroft Homes. Julia I think I will recover my favorite wing chair (for the third time and give it a fresh look! Love this hoe, so unique. Also love any home with its own name! OH, MY! This home is amazing! The craftsmanship is just “wow”! And what about that front porch? Inviting! Beautiful post, Julia! Thank you! I adore the exterior of this home! The interior is not quite to my taste, although very beautiful. Unusual lighter coloured Edwardian sort of look, but a bit too much pattern for me. Thanks for the look. By the way, what a perfect home for a corner lot. Watch the world go by on that porch! And the lookout room is brilliant. Love, love, love the exterior – the turquoise pillows look great with the grays of that home. Love that it looks so traditional and not like 2011. You really can’t tell the age of that home from the outside. As for the inside – beautiful, but not my style. I’m afraid that living room ceiling is a bit much for me. Interior – not so much (my taste)…and never thought these words would pass my lips (or my fingertips, as the case may be!) but the trimwork is too much! Gasp! 😉 Love the kitchen cabinets but the ceiling design and the trimwork in the dining room is just too elaborate for me! Would’ve loved to see a simpler interior…think it would’ve complimented the exterior a little better. How could anyone not love this house??? It is GEORGOUS inside and out! WOW!!! I swear, nobody does cute houses like the Southerners! This is a magnificant house. Love all the detailing. We need a nationwide movement, IMO… do away with the BiLevel and more of this!!! The exterior is lovely; warm and inviting. The interior (especially that living room ceiling!) is overdone, claustrophobic and yet, somehow bland. I live in Louisville and always go to the Homearamas! Norton Commons is a great planned community but the homes are ON TOP of eachother. If I’m gonna pay at least half a million bucks for a house I want some room. These homes don’t have a yard to speak of. Very nicely made and decorated with AWESOME tile but I couldn’t live there…… too grand. It’s a bit over the top for my taste! The exterior is lovely but it doesn’t seem that cosy! 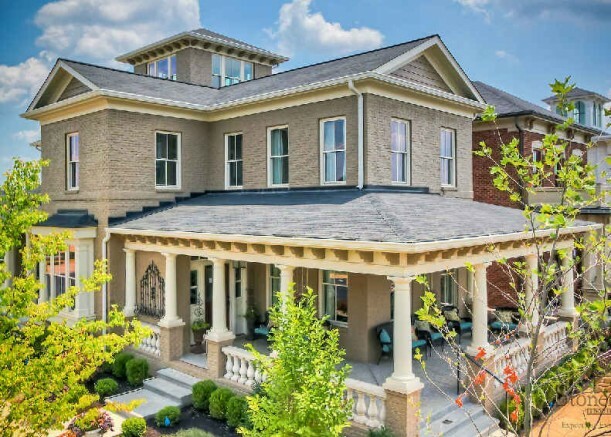 Ok, pretty home..but what I’m DYING over is $689,000 for THAT home and 4,456 square feet!!!! What the?! A home like that where I’m from in Southern California would probably be a couple million for sure. If you are curious what that kind of money will NOT buy you where I’m from check out my blog. We paid a bit over that amount and we have a work in progress. Ugh. We need to move! 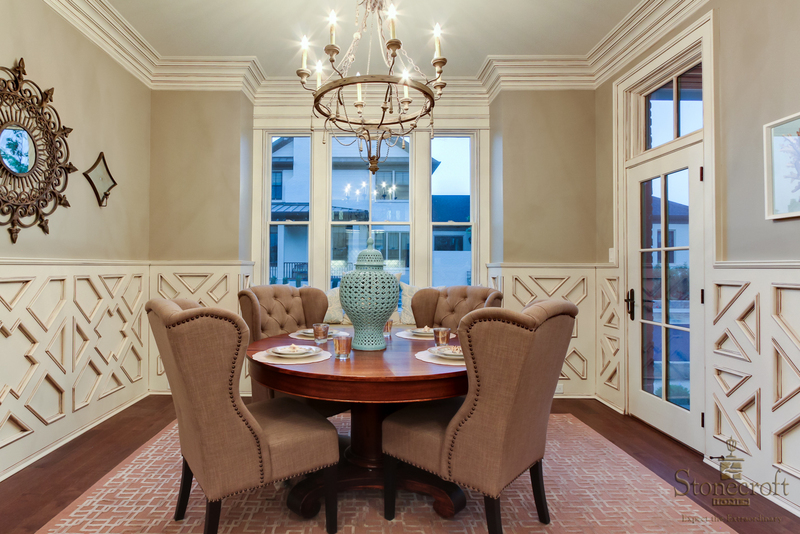 This house had too much in the way of details…….for example, the dining room details. The living area was too busy for my taste. Looks like the craftsmanship is great, though. I love the idea of a square with fountain! The exterior is absolutely gorgeous and the interior is nice, but there’s things I don’t like about it. Like the ceiling in the living room. But all in all, nice home. Boy howdy. I want to like this house. Really, I do. The outside is so lovely! I fear the multiple patterns on all the surfaces inside, though — even though it’s a lot of white-on-white (which I usually love). Anyway, it’s fun to look at! It’s cute, but it’s almost too “new,” if that makes any sense. I think the trim on the inside is too much, too. But holy moly, that’s a lot of house for a pretty reasonable price! I have a love hate with Norton Commons. Part of me wants to live there and the other part is resisting like the plague. It is a great community, close to the grocery and Costco and they have a farmers market on saturday and thursday night is the block party for the whole family. There are quaint little shops and in the future there will be a school and a YMCA…. 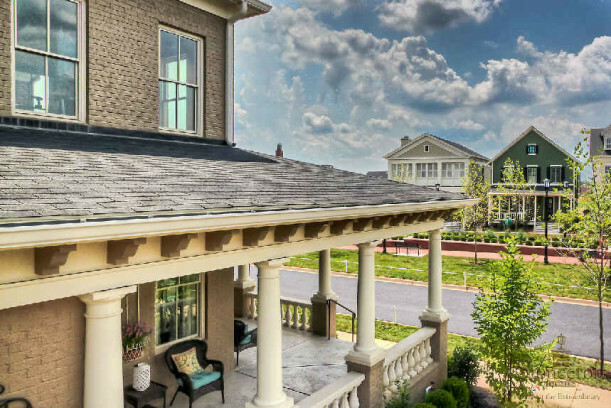 There are well established communities in L’ville that offer the same type of amenities that ARE original (sub)urban and not suburb-sprawl. I also got a little creeped out a few years ago when a friend of mine who is a realtor wrote a really nice blog post on the area and he got a cease and deist letter from the community attorney. They wanted to be in control of all the media on their development. He was strongly urged to delete the posting. I can attest to the leadership of Norton Commons behaving that way. Not cool. I’m a Realtor as well and it doesn’t make sense as I was only promoting their neighborhood. Oh and the good news, it is one of the bright spots of our economy. 16 of the 21 homes are already sold before the Homearama even started. I can’t stop looking at them. Seriously the most beautiful houses I have ever seen. Great post! 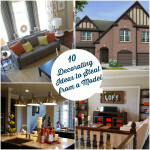 I just toured Homearama two days ago and will be writing my post for LouisvilleHomesBlog.com (my contributor sent in her Interior Design post today, check it out) but I was curious, if you don’t live close to Louisville to visit, did you simply find these photos on the Builders site to make this post? Looking forward to seeing your post about it, Tre! To answer your question, I had featured one of Stonecroft’s homes before, and Jason Black sent me an email telling me about Homerama and their contribution to it. I love that they build new houses with some of the look and detail of old ones. Love the exterior, but agree with cbean that the inside is way to stuffed with stuff. And yet will all that visual detail it never comes together. Leaves me bored. Wow! That’s a very beautiful house!! Hi Julia wow absolutely beautiful. The outside is beautiful and I love the kitchen and dining rooms oh and that colour on the walls love it. Till next time regards Esther from Sydney. 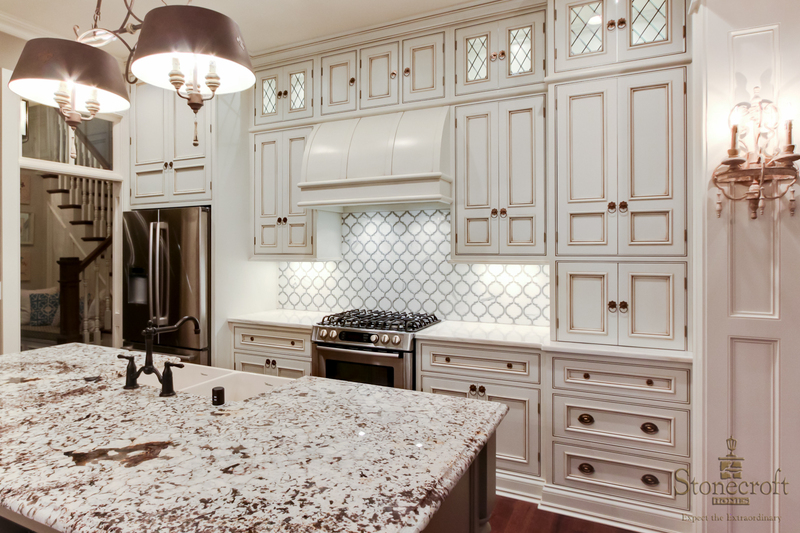 PS we are being bombarded with home reno shows at the moment gone into reno overdrive… Thanks for a great blog. Wow, I can’t believe all the negative comments. This home was built to showcase the builders talents, etc…it’s in Homearama which is a HOME SHOW, so of course it’s going to be over the top. It’s like going for a job interview. You don’t wear sweat pants and a t-shirt you dress to impress and that’s exactly what the builders are doing here. Great job Stonecroft keep up the good work!! I love wingback chairs. To me, they’re classics. That ceiling is amazing. Like you, it might be a little much for me personally, but it seems to fit the house. Hope you’re enjoying a nice summer. cheers! 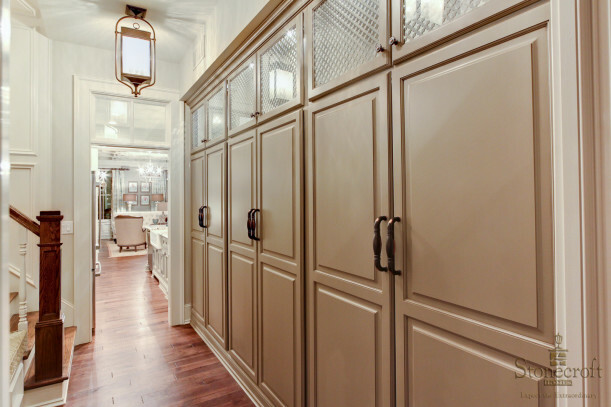 OOOOOOO Love that storage idea.. hmm wonder what’s behind my walls in my hallway and can I make them into storage..
Oh I always love to go on these home tours … there are always great ideas to glean even if a home isn’t just your style! Maybe vernacular on the outside (except the look out-which I find a little bit unnecessary), but a little bit more garish with too much trim work, especially in the living room. The kitchen looks classy! The video is exceptionally well-made and inspiring. Thanks for the post! Maybe it’s just the way the house was photographed but these images look like computer models…not quite enough depth and texture, too perfect clouds and trees. I have a good friend who makes models for architectural firms. Her work is gorgeous and convincing but has the same sterile feel of these. Real images or not, there’s a lot to love in this house. I wonder if my 1960s ranch could support a peek-a-boo room like that!? I live in the Louisville area but have been skipping Homearama the past few years because I’m tired of the McMansion look and feel. Wish I would have gone this year, because Norton Commons is a special neighborhood. It’s out in the middle of suburbia on the outskirts of the city, but they’re trying to create a real community feel. The yards aren’t big, the porches are close to the sidewalks, and there are local-run businesses right within the neighborhood. We looked at a few houses there before deciding to build our own new-old house. 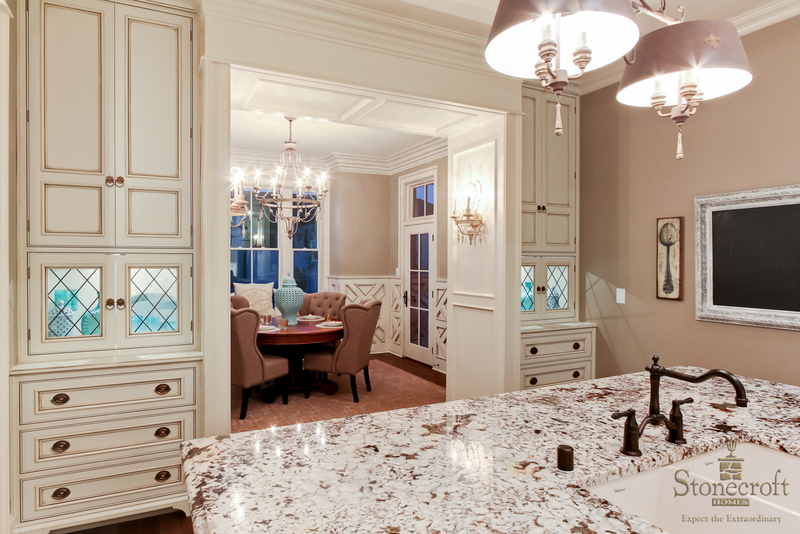 We like the look of older homes, but like you, want the modern amenities (and no renovation necessary! ).